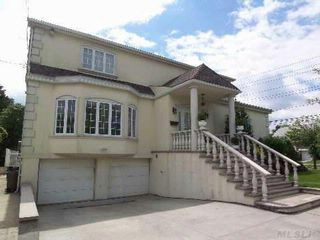 This custom built house is located at the corner of a lovely Belle Harbor beach block. The style is a center hall colonial - formal entrance and coat closet, large formal living room to the left, spacious den to the right, custom dining room, elegant powder room and eat in kitchen with natural oak floors throughout. Upstairs are 3 large bedrooms and full bath, including a tremendous master suite with master bath. The basement has an additional suite, den, laundry area and walk in storage room. The 2 car garage is attached and has additional parking in the private driveway. The custom kitchen has dark wood cabinets, top of the line stainless steel appliances, large island with granite counter tops, 2 sinks, walk in pantry room and double sliding doors to a deck and tremendous backyard! Rebuilt in 2000 using the finest building material, you can literally move right in!